This MHP natural gas grill features a high profile, thick, permanent mold cast aluminum housing, 433 1/2 square inches of primary bbq grill area (642 total area including stainless warming rack), 40,000 BTU stainless H-type dual burner, 5/16 inch two-piece stainless cooking grids, folding stainless side shelves and electronic ignition. Includes 48 inch black, anodized aluminum in-ground post with stainless steel tubing. Includes stainless grease cup for easy clean-up. Some assembly required for this MHP BBQ Grill. This MHP natural gas grill features a high profile, thick, permanent mold cast aluminum housing, 433 1/2 square inches of primary bbq grill area (642 total area including stainless warming rack), 40,000 BTU stainless H-type dual burner, 5/16 inch two-piece stainless cooking grids, folding stainless side shelves and electronic ignition. Includes black, aluminum column and black, cast aluminum base with 8 inch wheels and locking casters. Includes 12ft hose with quick disconnect coupler and stainless grease cup for easy clean-up. Some assembly required for this MHP BBQ Grill. This MHP natural gas grill features a high profile, thick, permanent mold cast aluminum housing, 433 1/2 square inches of primary bbq grill area (574 total area including SearMagic warming rack), 40,000 BTU stainless H-type dual burner, reversible anodized aluminum SearMagic cooking grids, folding stainless side shelves and electronic ignition. Includes black, aluminum column and black, cast aluminum base with 8 inch wheels and locking casters. Includes 12ft hose with quick disconnect coupler and stainless grease cup for easy clean-up. Some assembly required for this MHP BBQ Grill. This MHP natural gas grill features a high profile, thick, permanent mold cast aluminum housing, 433 1/2 square inches of primary bbq grill area (574 total area including SearMagic warming rack), 40,000 BTU stainless H-type dual burner, reversible anodized aluminum SearMagic cooking grids, folding stainless side shelves and electronic ignition. Includes stainless column and black, cast aluminum patio base. Includes 28 inch stainless gas feed line and stainless grease cup for easy clean-up. Some assembly required for this MHP BBQ Grill. This MHP natural gas grill features a high profile, thick, permanent mold cast aluminum housing, 433 1/2 square inches of primary bbq grill area (642 total area including stainless warming rack), 40,000 BTU stainless H-type dual burner, 5/16 inch two-piece stainless cooking grids, folding stainless side shelves and electronic ignition. Includes stainless column and black, cast aluminum patio base. Includes 28 inch stainless gas feed line and stainless grease cup for easy clean-up. Some assembly required for this MHP BBQ Grill. 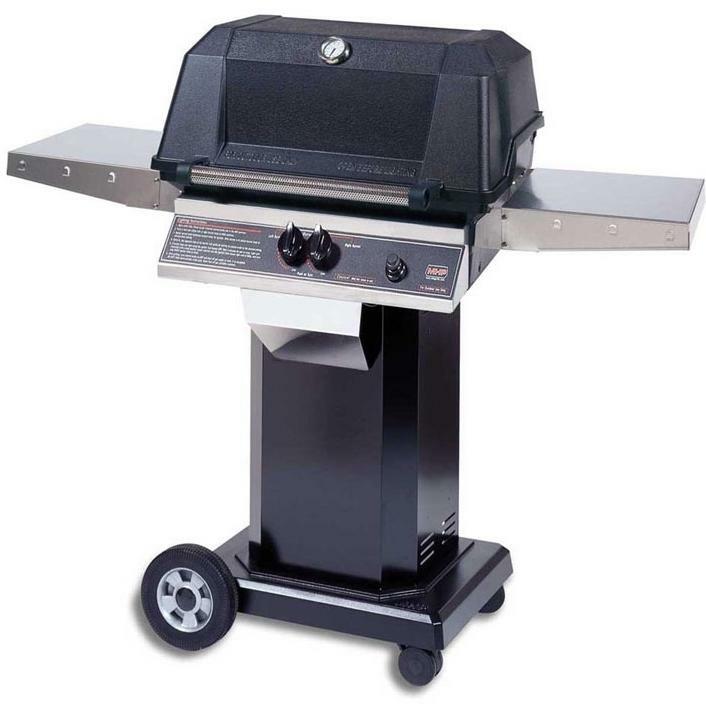 This MHP propane gas grill features a high profile, thick, permanent mold cast aluminum housing, 433 1/2 square inches of primary bbq grill area (574 total area including SearMagic warming rack), 40,000 BTU stainless H-type dual burner, reversible anodized aluminum SearMagic cooking grids, folding stainless side shelves and electronic ignition. Includes stainless aluminum column and black, cast aluminum patio base. Includes propane hose and regulator with fuel level gauge and stainless grease cup for easy clean-up. Some assembly required for this MHP BBQ Grill. 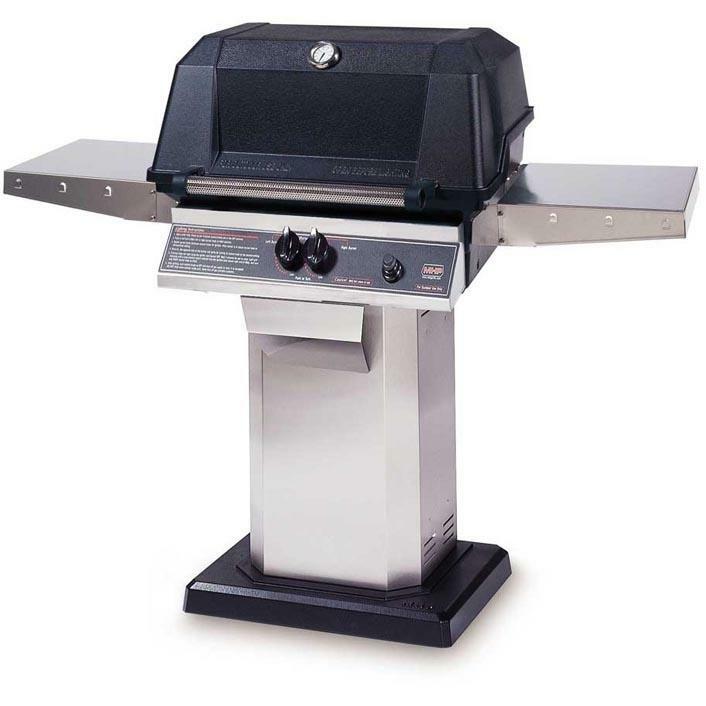 This MHP propane gas grill features a high profile, thick, permanent mold cast aluminum housing, 433 1/2 square inches of primary bbq grill area (642 total area including stainless warming rack), 40,000 BTU stainless H-type dual burner, 5/16 inch two-piece stainless cooking grids, folding stainless side shelves and electronic ignition. Includes stainless aluminum column and black, cast aluminum patio base. Includes propane hose and regulator with fuel level gauge and stainless grease cup for easy clean-up. Some assembly required for this MHP BBQ Grill. 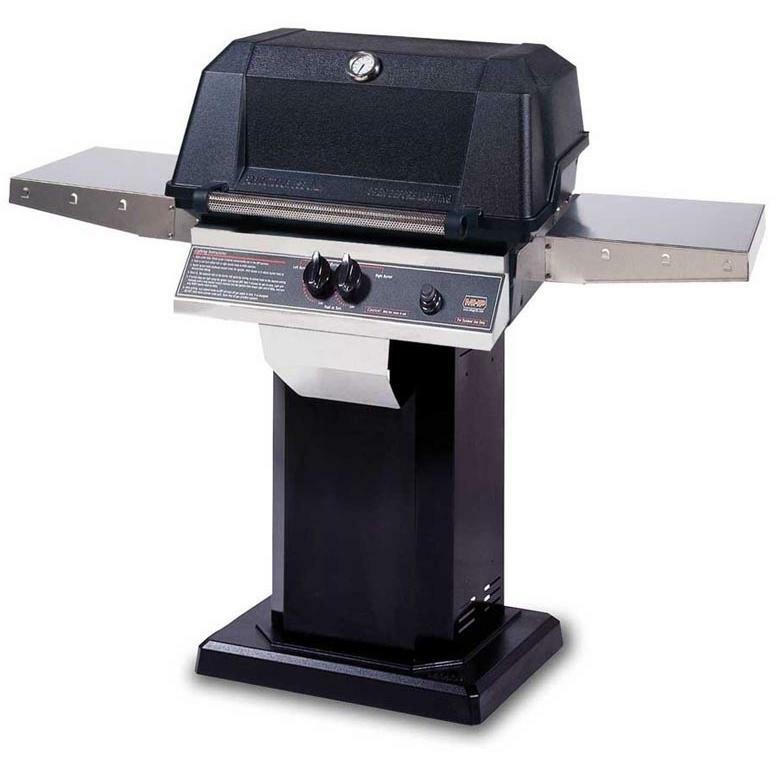 This MHP propane gas grill features a high profile, thick, permanent mold cast aluminum housing, 433 1/2 square inches of primary bbq grill area (574 total area including SearMagic warming rack), 40,000 BTU stainless H-type dual burner, reversible anodized aluminum SearMagic cooking grids, folding stainless side shelves and electronic ignition. Includes stainless column and black, cast aluminum base with 8 inch wheels and locking casters. Includes propane hose and regulator with fuel level gauge and stainless grease cup for easy clean-up. Some assembly required for this MHP BBQ Grill. 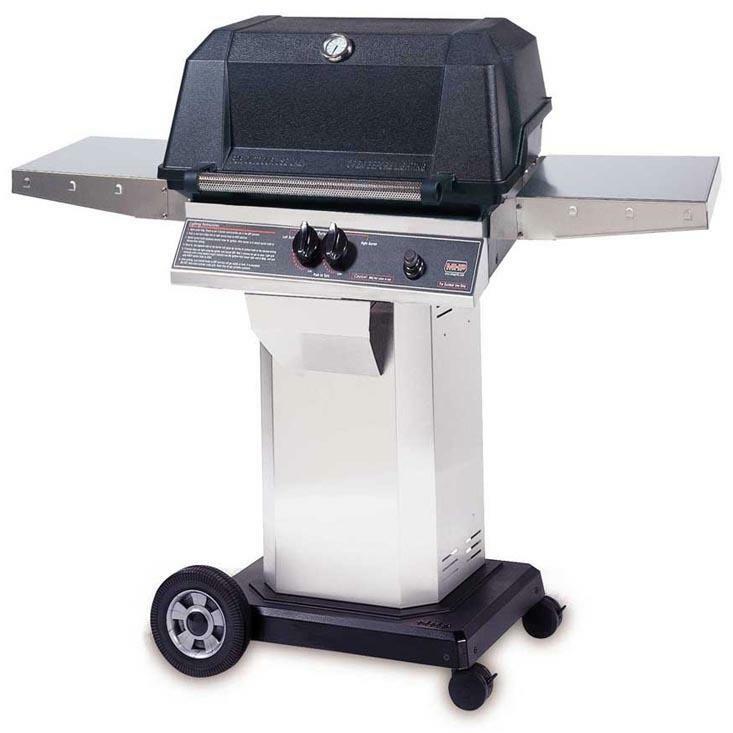 This MHP propane gas grill features a high profile, thick, permanent mold cast aluminum housing, 433 1/2 square inches of primary bbq grill area (642 total area including stainless warming rack), 40,000 BTU stainless H-type dual burner, 5/16 inch two-piece stainless cooking grids, folding stainless side shelves and electronic ignition. Includes stainless column and black, cast aluminum base with 8 inch wheels and locking casters. Includes propane hose and regulator with fuel level gauge and stainless grease cup for easy clean-up. Some assembly required for this MHP BBQ Grill. This MHP natural gas grill features a high profile, thick, permanent mold cast aluminum housing, 433 1/2 square inches of primary bbq grill area (642 total area including stainless warming rack), 40,000 BTU stainless H-type dual burner, 5/16 inch two-piece stainless cooking grids, folding stainless side shelves and electronic ignition. Includes stainless column and black, cast aluminum base with 8 inch wheels and locking casters. Includes 12ft hose with quick disconnect coupler and stainless grease cup for easy clean-up. Some assembly required for this MHP BBQ Grill. This MHP natural gas grill features a high profile, thick, permanent mold cast aluminum housing, 433 1/2 square inches of primary bbq grill area (574 total area including SearMagic warming rack), 40,000 BTU stainless H-type dual burner, reversible anodized aluminum SearMagic cooking grids, folding stainless side shelves and electronic ignition. 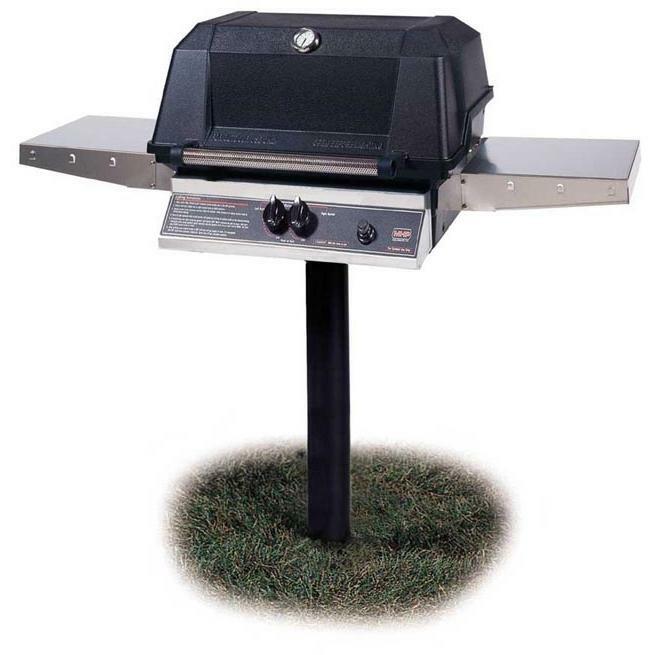 This natural gas grill includes stainless column and black, cast aluminum base with 8 inch wheels and locking casters. Includes 12ft hose with quick disconnect coupler and stainless grease cup for easy clean-up. Some assembly required for this MHP BBQ Grill.